If you have an older iPhone Battery Replacement might be imminent. A group of consumers are suing Apple for allegedly causing their phone to stop working. What is this Apple Lawsuit about? First, someone alleged in a Reddit post that certain iPhones had battery and performance issues. Then, this allegation was investigated by Primate Labs who found some real iPhone problems resulting in running much slower and suddenly shutting down. Because software caused the device to max out processor power, the device would shut down. As a result, they’d shut down due to the older devices’ batteries which couldn’t provide enough power. In conclusion, they allege, that Apple knowingly updated software to cause problems, which forces people to upgrade their device. Apple’s response was to apologize, and to reduce the price of a replacement battery from $79 to $29. Apple is offering these discounted iphone battery replacements through the end of 2018 for models dating back to the iPhone 6. If you own an iPhone 6s, then you may even be eligible for a free battery replacement, stemming from problems with some models manufactured in 2015. Which models are named in the lawsuits? How Do I Get in on the Apple iPhone Settlement? Currently, the case(s) are still being considered in court. Because the latest was to consolidated to one case (class action lawsuit), the case is progressing. 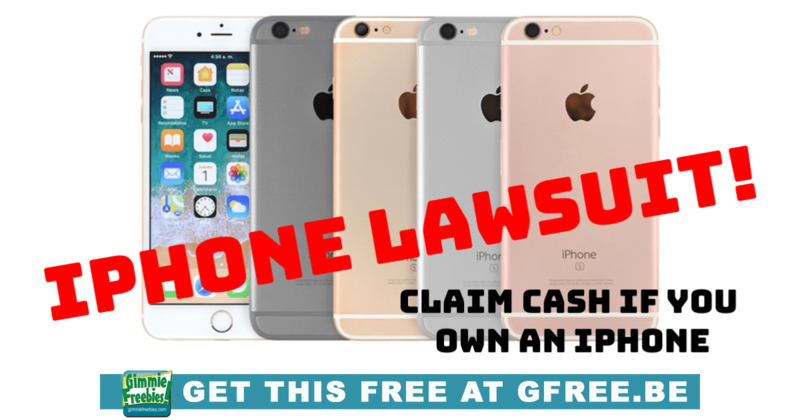 If Apple decides to settle out of court, then you will be contacted or may need to submit a claim. Stay tuned: because we will update here with that information and notify you. Love freebies? Be sure to see all of our Newest Freebies here!